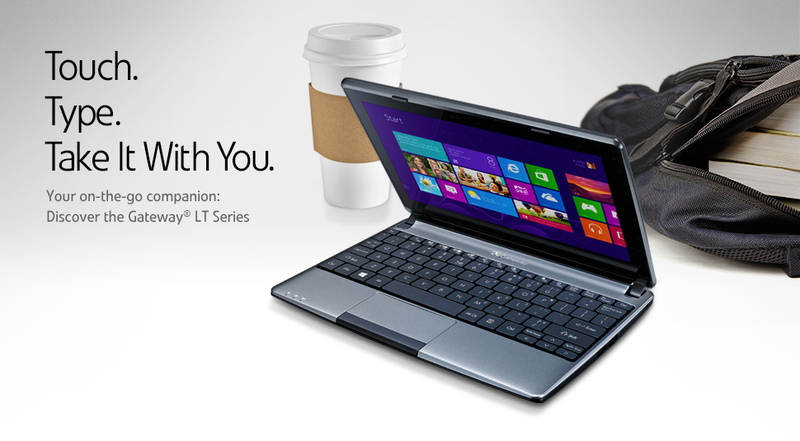 Experience our first 10.1” HD notebook with touch: The Gateway® LT Series. Stay connected on the go with this ultra mobile, ultra versatile companion. In the morning, use your LT at the local coffeehouse to check traffic on the vibrant HD touchscreen. At lunch, use Gateway® Touch Tools to add pictures to your social media. Work on your Office documents in the afternoon, and in the evening check movie times. With up to 10 hours of battery life, your LT Series is still going—and, like you, it’s always in touch. The precision of 10-point touch technology makes the most of the LT Series’ dramatic HD display. Tap into fun as you surf the web like never before. Get more done quicker! Performance is faster with new-generation Intel® Celeron® processing, and transfers and connecting are easy with Bluetooth® and HDMI®. Leave the power adapter at home. Get up to 10 hours of continuous connectivity for your travels with an LT Notebook with available 6-cell battery. Available Office Home & Student 2013 keeps you productive on the go while Gateway Touch Tools make it simple to create, capture and share.